Spinners have had plenty of help from the pitches during India's Test series against South Africa, and the extent of the help they have had has been the topic of a fair few debates. Some have felt batting has been a lottery, others that batsmen from both sides have made them look worse than they actually are. 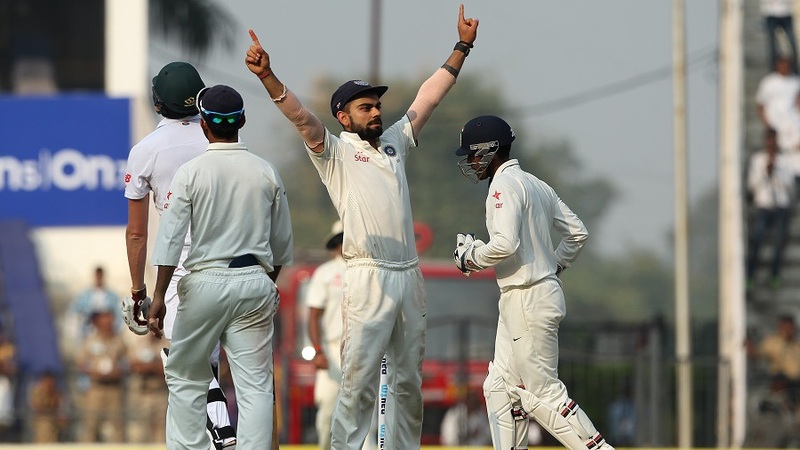 At the end of the third Test in Nagpur, India had wrapped up their second straight Test series win, and ended South Africa's nine-year unbeaten run away from home. They were impressive achievements, but the bulk of the questions posed to Virat Kohli at his post-match press conference were about the pitch. Kohli said he had no problem with pitches like the one in Nagpur, calling them preferable to flat decks that produced 500-plus totals. "It is not a policy [to play on such pitches], it is the conditions that you get in India. Otherwise you will just play Test matches which will get you 500 runs in an innings. You don't create bowlers like that, you don't win Test matches like that. The key is to win Test matches. "I have said this before, wherever you go to play in the world, you've got to be prepared to face those conditions and tune your game accordingly. Today was a classic example of two guys [Hashim Amla and Faf du Plessis] applying themselves and showing that it can be done. I don't know why is there so much hype created around the issue. "There are a lot of people writing a lot of things about the pitch. 'It should not be like this', or 'it is turning too much', people sitting somewhere else and speaking about the pitch in India. I think it is just a matter of mindset where people are just giving their opinions and they are free to do so. I don't feel that way, we have never complained when we had challenging conditions and won't complain in the future either. "We have tried to improve our game, it is always a matter of us not having the technique or us not having the mental strength to cope with conditions away from home. But when these sorts of things happen, everybody starts talking about how it is an undue home advantage. In the last few years if you see the stats of any team they are dominating at home and that is how Test cricket has gone. Whoever has won away from home is the No. 1 or No. 2 side in the world. I think that takes a lot of character and that won't happen every time. "South Africa hadn't lost in nine years and it is very hard to maintain that sort of record. Credit to them, they have not lost an away series for nine years but I would give credit to our boys for putting equal amount of pressure in the course of these three Test matches and actually win the series. I don't see anything more or less to it." According to Kohli, India's batsmen could themselves have dealt with the conditions better. "I would not like to comment on what the opposition did not do," he said. "Us as a batting unit, and I said this in Mohali as well, we haven't applied ourselves properly. One or two batsmen have but I think to play well consistently you have to apply as a batsman so we are talking of four guys out of six. But that's not what happened and it has been two-odd guys every innings and that does not get you to a big total. "We have still been able to get to 220-225-odd three times out of four but as I said, if two guys apply themselves and the rest don't, then things don't go as planned. I am talking about our batting group. Even on turning pitches, if you apply yourself and if you are determined to dig in and play a game that is not natural to you, you can score runs. "Our batsmen did that in Mohali and Vijay got a decent start in the first innings [in Nagpur]. Pujara played well, in the second innings Shikhar got 40-odd, so everyone showed that runs can be scored. It was more a case of batsmen making mistakes rather than the ball doing some crazy things out in the middle. I think it was more of a mental thing which needed more application." Playing in similar conditions, Kohli said, would help India's batsmen improve their game against spin - which some experts felt had deteriorated when they lost the first Test on their tour to Sri Lanka in August. "As I said, these are the conditions that you get in India," he said. "When we collapsed in Galle, someone was saying that we have improved our fast-bowling play but we don't how to play spin. And now we are playing on spin-friendly wickets and this is the problem as well. I don't know where we find the balance. "We as a team feel we have to improve our play against spin as well. These are the conditions we get in subcontinent and we have to play a lot of Test matches [in the subcontinent] in future as well. So, as a team in future, this is a learning phase as well for us. We need to step up our game in order to win Test matches like we have done this time." Kohli said he did not mind continuing to play on pitches like the one on Nagpur, even if it meant his batting record, and those of the rest of India's top order, suffered as a consequence. "I don't mind compromising on [batsmen's] averages as long as we are winning Test matches," he said. "I think that's our main concern, we are not playing for records, we are not playing for numbers or averages. Let's not get into that matter. Yeah, that's all there is to it. In Sri Lanka our performances weren't that great with the bat but we still won the series. It's the bowlers who are going to win you Test matches, as simple as that. "If you don't take 20 wickets, you can have an average of 55, it doesn't matter. These small contributions and team winning are more important rather than having an average of 50 and above and bowlers not being able to take wickets. I think you need to find an appropriate balance and sometime small contributions are more important than the big hundreds that we get in Test cricket."